MONTRÉAL.AI (EST’B’D 2003) | Montréal Artificial Intelligence, a research company at the forefront of the AI field, is developing and commercializing the most significant technology ever created by humans. We harness the fundamentals of artificial intelligence on a truly global scale and put them to strategically leverage enterprises, governments and institutions with precision engineering. 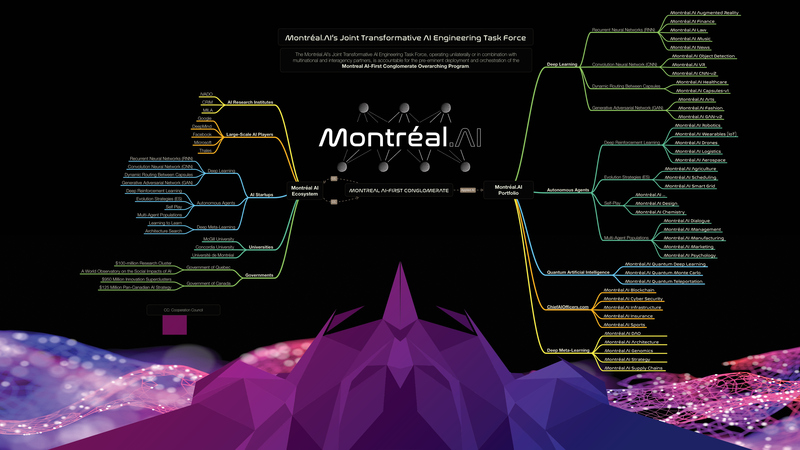 The Montréal.AI’s Joint Transformative AI Engineering Task Force, operating unilaterally or in combination with multinational and interagency partners, is accountable for the pre-eminent deployment and orchestration of the Montréal AI-First Conglomerate Overarching Program in order to powerfully scale AI to global industrial landscapes, to pioneer AI-first systemic business advantages and to win the AI race. Training the individuals who, with AI, will shape the 21st Century. Pioneering legendary fine AI arts opening the doors to the AI art movement. Consulting the right AI leader can significantly increase your odds of business success. Enhancing Humanity’s well-being by leveraging superintelligence to explore the Stars. Deploying artificial intelligence and ML models on the World Wide Web (WWW). Who do you turn to if you seek out the very best in Artificial Intelligence? Invitation-only | $25,000 membership fee. Montréal Artificial Intelligence adopts a new tradition of responsibility to create win-win situations. By focusing on the others players we develop cooperative opportunities within the wider perspective of society. Our Montréal.AI Academy inspires, supports and trains the individuals who, with artificial intelligence, will shape the Arts, the Sciences and the Humanities of the 21st Century to create a sustainable future. We are at the verge of a global technological shift. Drawing on extensive experience, Montréal.AI is starting an effort reaching out to Captains of Industry, Iconic Tech Entrepreneurs, Luminaries, Philanthropists, Scholars and Successful Financiers to join us at boardroom level in this task of historic proportions.